Have you ever felt like crying without a reason? It must be a women thing. I used to watch the TV show called “Everybody loves Raymond”. In one episode, Ray saw his wife, Debora, crying alone in the house. He wanted to find out what troubles her and ease her burden, but only to learn that there was no particular reason in Debora’s sobbing. She just wanted to let her emotions out. Ray couldn’t understand. At the end of the show Ray found himself alone in the house. He wanted to understand his wife, and the whole crying thing. So he turned on sad music, sitting quietly on the sofa holding a tissue box just like his wife did. He waited and waited, but couldn’t get emotional. He even tried to squeeze out the tears from his eyes but didn’t help. He gave up and changed the tune into a loud dance music, and started dancing. And the show ended. No wonder why everybody loves Raymond! I had a very good laugh on that episode. Not that Ray was clueless, but the difference between men and women were so well projected. How can I not love Raymond? Crying out every once in a while helps to clear out our emotional stress. Just like the dusts on the road get washed away after the heavy rain, crying is soul purifying and honest expression of our mind. So, let’s cry. Whether your life is throwing a stone at you, or someone touched your life with kindness, cry it out. It is good for you. Then, look for a good comfort food for yourself. This was a little thought of the day I had as I was making today’s recipe. I made easy Korean beef rice bowl (bulgogi dupbap, 불고기 덮밥). This is great Korean style comfort food. 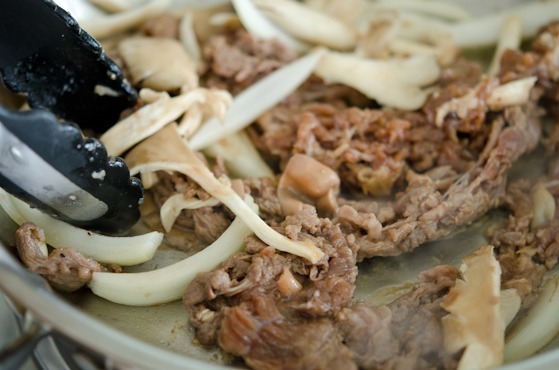 Traditionally Bulgogi takes time to marinade but with this simplified version, you can cook right away. 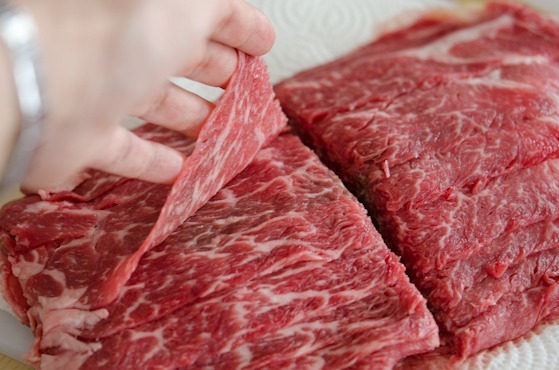 Here is beautiful thin slices of beef. Sirloin, rib eye would be good choice. I let it rest on the kitchen towel for a few minutes to soak up some blood. Meanwhile, grab these stuff from your pantry. 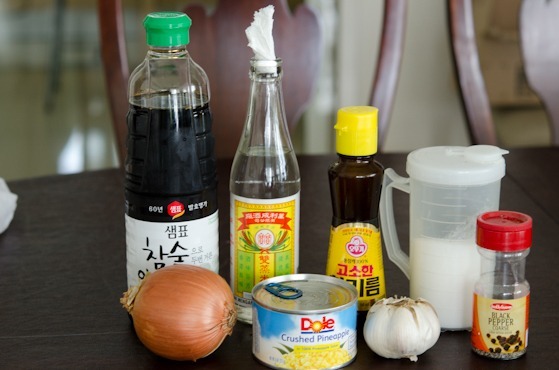 Soy sauce, rice wine, sesame oil, sugar, onion, canned pineapple, garlic, and pepper. Mix all the sauce ingredient. 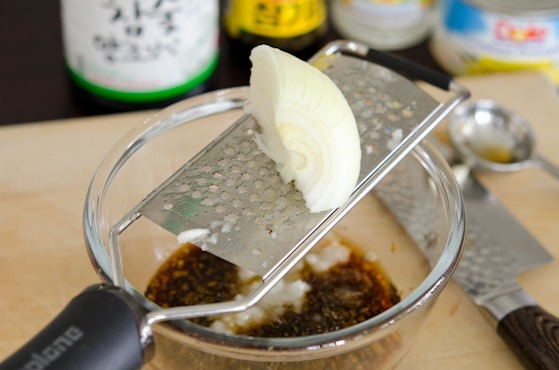 Grating onion will give you a good reason to cry. Now, this is crushed pineapple. The acid in pineapple will break down the muscles of beef and tenderize the meat beautifully. Add about 2 tablespoon to the sauce. Then, how about the leftover pineapples? Don’t you hate opening a can and only use a little bit of it? 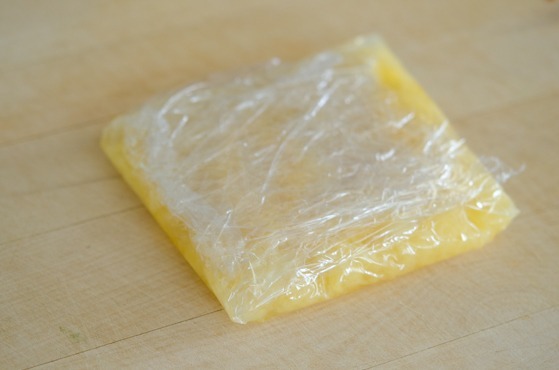 Wrap the leftover pineapples with a plastic wrap and keep in the freezer. Just break off the desired amount for your next cooking need. Or add to your smoothie. 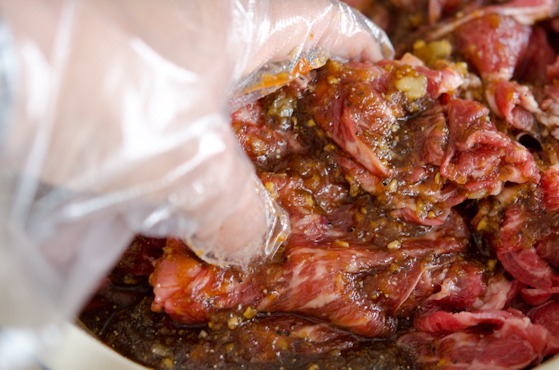 Pour the sauce over the beef and mix well with your hand. You want to let it sit for 15 minutes so the beef can soak up the flavor. Speaking of flavor, I usually add this sea kelp stock to the mixture. My little secret to make flavorful Bulgogi, but you don’t need to if you don’t want your cow getting wet in the sea water. Heat skillet over medium heat and place your meat. You gotta have vegetables. So add some onion and any mushroom of your choice. Toss to cook everything in the skillet. Serve over hot rice. You gotta eat this Bulgogi with Kimchi. Divine! I will share a special bonus today. If you want to let your tears out for any reason, listen to the song below. Yes, it is Korean song but not the kind you hear these days. K-pop is not always about the pretty boys and girls, nor the funny dance moves. There are many amazing artists who creates beautiful music and this song is one my favorite. If you understand Korean, you will find how beautiful the lyrics are. Some says this song makes them cry even if they don’t understand the words. For me, I feel like heading to Karaoke and sing my heart out with this song! Hope your weekends are as beautiful as you are. 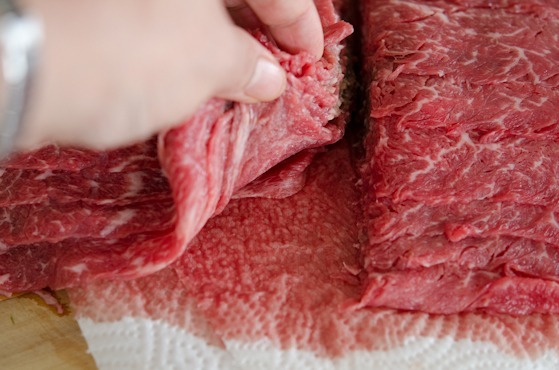 Place beef on a few layers of kitchen towel and drain some blood. Meanwhile, in a small mixing bowl combine all the sauce ingredients and mix well. 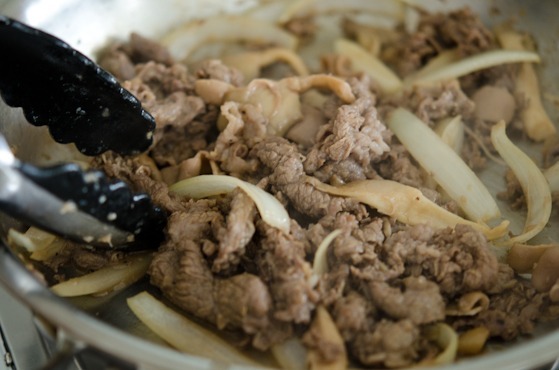 Place the beef in a large mixing bowl, pour the sauce and mix well with your hand. Let it sit for 15 minutes for the meat to soak the flavor. Heat a skillet over medium-high heat, add some beef (You might need to cook 2-3 batches to cook evenly), onion, and mushroom. Start tossing all together to cook evenly, about 2-3 minutes. Serve over freshly cooked hot rice and sprinkle sesame seeds to garnish. Kimchi will make a wonderful side dish to serve with. 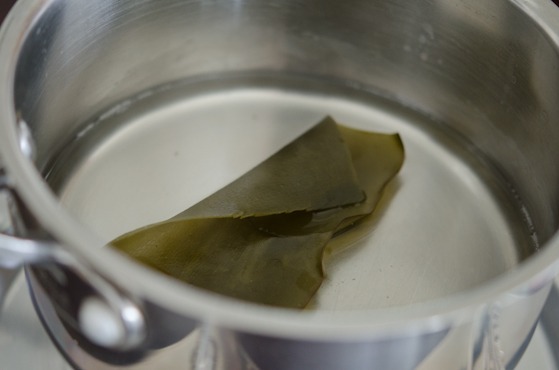 * To make sea kelp stock, simmer 1 cup of water with a piece of dried sea kelp for 10 minutes. Thank you! I am definitely going to try this. It doesn't call for a lot of complicated ingredients which is great. I'll let you know how it goes. Who doesn't like rice bowl? I'd certainly cry if I could never have one again! Really nice recipe - I like the inclusion of pineapple. Such a nice flavor, and it should go well with the beef. And I agree kimchi would make a terrific accompaniment! Fun post - thank you. So glad I found this awesome recipe! The boyfriend and I were obsessed with Yoshinoya but to be more health-conscious and all, we gave it up! But now I can make this! Best of all, I bet its 10000x better than Yoshinoya! Yoshinoya can't be compared to Bulgogi. 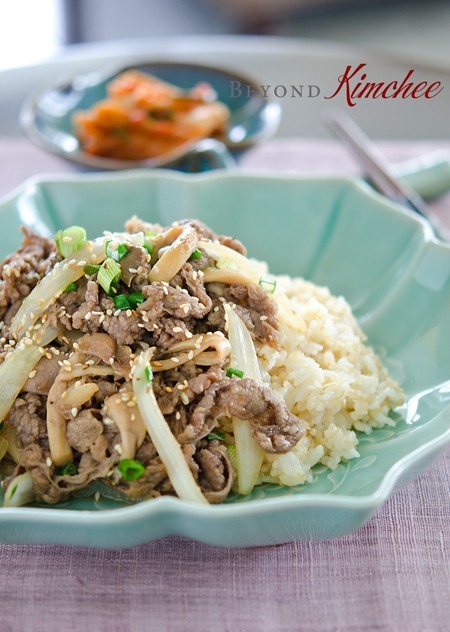 Bulgogi is Korean comfort and anyone can make at home easily. Hope you and your boyfriend would like it. Tea with kimchi sounds great! ha ha! Hope you can visit here again. I don't think I've seen the drama but I heard a lot about it. I am glad that you liked the song. Hi Holly I was just thinking about what to cook for lunch tomorrow for my nephew when I come across this recipe. It looks simple and nice. I will definite oook this. By the way where did you get the bee from? Its very well cut. Thanks alot. I got it from local Korean butcher shop. They can slice the meat super thin. Thank you so much for posting this recipe - will definitely try this!! Who is the artist who sings the song on the video? Thank you for this recipe! I love your blog by the way! Crushed pineapple in kogi? wow, I have never tried that. I will definitely give this recipe a go! thank you! and hope that you are ok. . you are right, a good cry is good for the soul. You can use pear if you have a few hours to marinade. 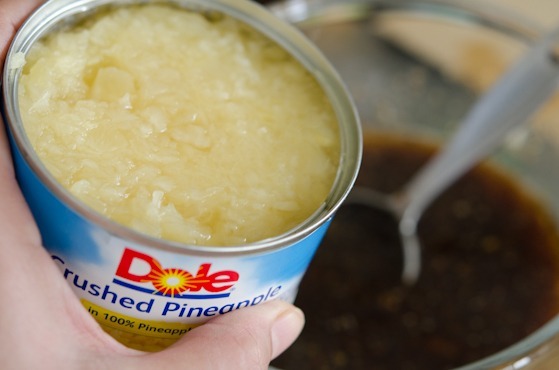 Pineapples will shorten the marinading time but don't let it sit more than 30 minutes though. It will be too soft. Hi Holly I cooked this today for lunch and my nephew loves it so much that he requested me to cook it again for lunch tomorrow. Thanks alot for any delicious recipe. Great to hear that you nephew loved the dish, Caroline. Thanks for letting me know. Oh, Holly! In the midst of moving house, I've felt like bursting into spontaneous tears many times over the past few days. 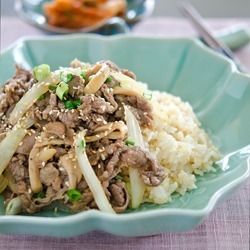 I think I need bulgogi to cheer me up. Thanks for the great, fast recipe and tip about the pineapple. Dear Ann I pray for your safe, complete move. Moving is one of the most stressful events in life in my personal opinion. I have done it many times and I know exactly how you feel. Good luck and it will be over soon. This looks wonderful Holly - I love the use of the fruit to tenderise the meat. I always love your posts - thanks for sharing. Thanks for sharing this recipe and beautiful song! I'm semi-fluent in Korean, and even though I don't understand this whole song, it really touched me today. Thank you! hi, holly... can u give me any suggestion to replace rice wine in this recipe? Hi Ana, You can leave the rice wine out. It won't change the flavor much. Do you add the kelp broth to the marinade or to the skillet after cooking the meat? Hi Kelly Add the kelp broth to the marinade before cooking. Thanks. Thanks so much! Made this tonight and everyone loved it! 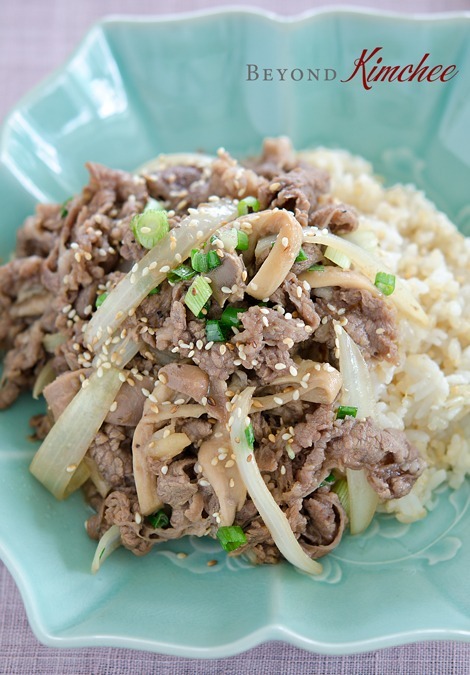 We lived in Japan for several years and gyudon was one of the kids' favorite meals. We were lucky enough tonight to have some homemade kimchee (made by dear friends) to serve with it. Just found your site, and I can't wait to try more things! I just wish I had an Asian grocery nearby. I will have to do some planning and make a big internet purchase! Hi, My husband and I made Kimbap from your recipe today and we loved it! Thank you so much for writing this recipes. 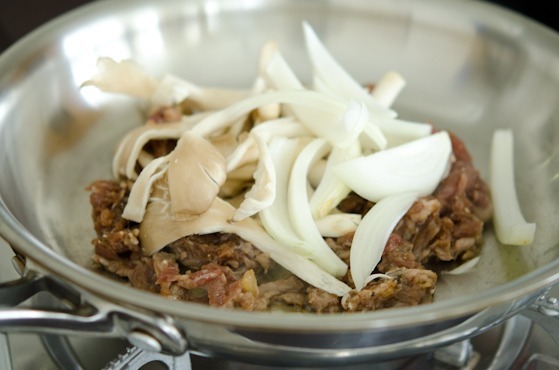 We lived in Korea for two years and we miss it :( I was looking at this recipe which I will try soon and I am listening to the music video right now and makes me miss Korea more. It was such an amazing adventure and I am so glad we were able to live there for those two years. I am hoping to past on these recipes to my children. Hi Stephani That is so great to hear that you loved kimbap. I miss Korea, too. Can't wait to visit and eat all the great food. Glad to hear that you enjoyed your 2 years in Korea.